University of Melbourne graduate researchers showcase their research using 60-second eposters to communicate their complex research. Using the competition template and with a strict time limit of 60 seconds, participants can include images, video, sound, animation, visualisations and text. Join us for refreshments as Professor Justin Zobel (Pro Vice-Chancellor, Graduate and International Research), and our celebrity judges: Thesis Whisperer (Assoc. Professor Inger Mewburn) and Simon Clews (Melbourne Engagement Lab) announce the winners of the 2018 competition. Who will represent the University of Melbourne in the national showcase? Vote in the Viewers' Choice Award. ePosters will be on display at the event and via an online gallery. 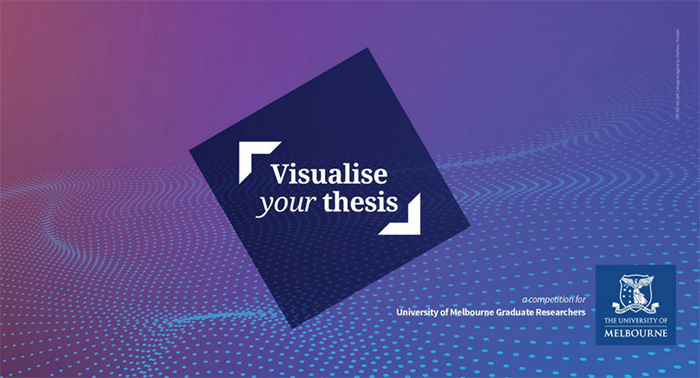 Visit the Visualise Your Thesis website for more details about the competition.